Lately I’ve been spending entirely too much time perusing the many pages of the OSHA website, and I came across a list of the top 10 most frequently cited standards following OSHA worksite inspections for the 2014 fiscal year. What I find most useful about this list is that it highlights employees’ most common safety blind spots, which informs safety leaders of their greatest opportunities to reduce safety incident rates. Far too many workplace injuries and deaths are preventable, so to better understand why they continue to happen let’s take a quick look at the specific blind spots associated with these safety standards, using the 4-factor S.A.F.E. Model of SafetyDNATM. Example: An experienced roofer fell to his death after removing his fall protection to work on a hard-to-reach area of a rooftop. Example: A plant worker who had not read the hazard information and handling procedures for a noxious chemical spilled a drum of the chemical while improperly moving it. Example: A painter broke his leg when the scaffolding he worked on collapsed because it had not been adequately secured for the weight requirement. Example: A refinery employee who regularly walked through a danger area without wearing her respirator nearly died when she inhaled a toxic gas that leaked as she passed through the area. Example: A warehouse forklift operator not paying attention to where he was driving ran into the corner of a 20-ft tall shelving structure, causing it to fall and destroying thousands of dollars in merchandise. Example: A meat packer forgot to lockout a grinder before performing scheduled maintenance on the machine, which suddenly turned on while he worked on it, taking off three of his fingers. Example: A box store employee was seriously injured after falling from a portable ladder while stocking shelves. She was standing on the very top of the ladder at the time. Example: A railroad worker didn’t follow procedures for grounding the rail current while performing maintenance on the track. He was electrocuted and died shortly after. Example: A machinist who occasionally removed his machine guarding to make a difficult cut got his sleeve caught in the lathe, which pulled him into the machine and mutilated his arm. Example: An electrician working a new home build was violating regulatory installation procedures and electrocuted himself. His body was found two days later by construction workers. Although some of these violations are the result of poor organizational safety cultures, they are nonetheless manifested in the safety behaviors exhibited by individual employees that ultimately dictate the likelihood of an accident occurring. Therefore, what managers and safety leaders do (or don’t do) to prioritize safety at their job sites can greatly impact their employees’ risk exposures. 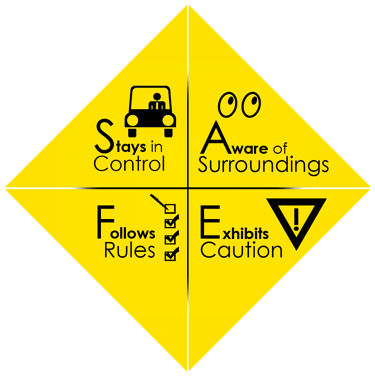 Safety leaders who know their employees’ SafetyDNA can use the information on this list to map the present hazards in their work environments onto their employees’ blind spots, allowing them to identify specific safety behaviors that, when adjusted, will greatly reduce employee risk exposures and save lives.